When the wasp Ampulex dementor attacks, it doesn’t just disable its prey. It turns it into a kind of zombie that marches itself to its own doom. 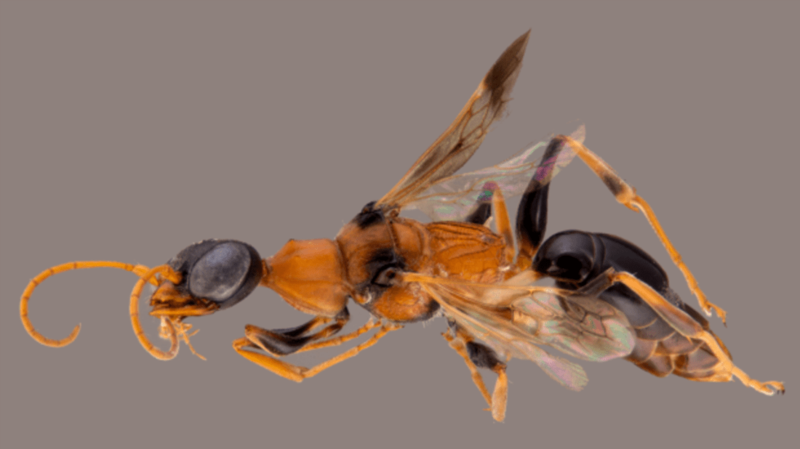 The digger wasp hunts cockroaches in Thailand, stinging them with a special venom that inhibits the unlucky cockroach’s escape. The cockroach can still move, but it suddenly becomes docile and seemingly obedient to the wasp’s wishes to devour it. According to a report by the World Wildlife Fund, the wasp injects a toxin into the neurons in a cockroach’s abdomen that block a neurotransmitter receptor controlling spontaneous movement. So while the roach victim can continue walking, it can't make a break for it as the wasp drags it by the antenna back to its nest to become dinner. A. dementor was named in 2012 by visitors to Germany’s Museum für Naturkunde, who thought its attack behavior similar to the eerie dementors in the Harry Potter series. For all of you muggles out there, those were the dark creatures who sucked free will and happiness out of anyone unlucky enough to cross paths with them. Yikes.